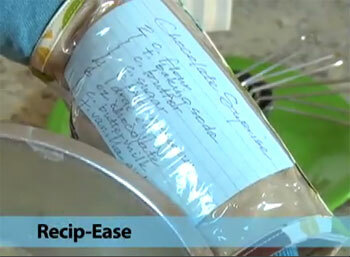 How convenient Recip-Ease makes it to read a recipe while cooking. 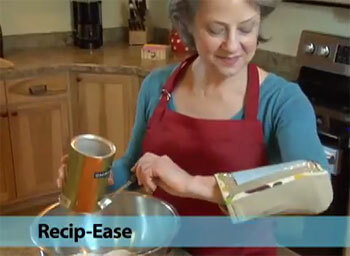 Now you only need to practice chopping, stirring, slicing and whisking with a big loose band hanging around your forearm! 1) Scour your closets, garage, basement, attic, or storage unit until you find something you were probably going to throw away. 2) Brainstorm every possible use for that item, no matter how impractical, inconvenient, redundant or absurd. 3) Create an infomercial video that desperately tries to convince people that your product is the latest and greatest thing to make their lives better. 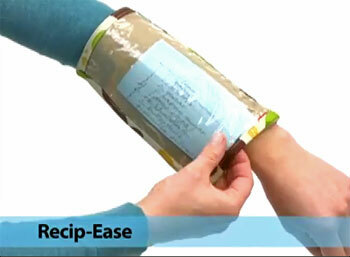 Whatever you come up with, chances are it will be a less pathetic product than the Recip-Ease. It reminds me of a particularly depressing Blue Peter “make”, if Blue Peter were presented by elderly women. And that voiceover – I can’t make out whether it’s a very human sounding computer or a frighteningly mechanical sounding woman! It looks like a football quarterback play sleeve. I wouldn’t my phone in that thing. Oh! I can’t wait to rip up all the recipes out of my cookbooks so I can place them in the sleeve! Super convenient!